Thats pretty cheap for a Botcon toy, Evac was only ?20 originally. Or is Galvatron undesired? I thought for sure I'd get outbid. Just because you can't win doesn't mean you stop working. I had a similar experience. I ended up paying $62.99 for Galvatron including shipping, which according to the current currency conversions on Google comes to 38.68 pounds. Thundercracker sells for more than Galvatron these days. Probably not much desire for the figure, and quite a few were produced compared to previous exclusives. Perhaps if he shows up more in fiction, desire will go up. I think just being a redeco doesn't help much. Though things like SG Optimus and SG Rodimus are expensive contrary to that fact. Coincidentally, FP just posted a whole bunch of leftover Botcon stuff. 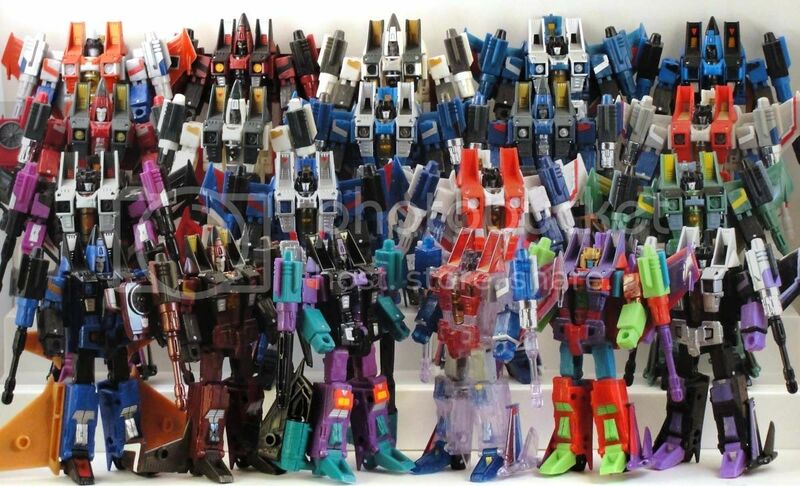 Presumably, most people wanted Thundercracker and a lot of them ended up hawking their Galvy on eBay to recoup costs. I think he probably would have been more popular if he had a new head sculpt, Primus knows I have three different EVACs already, an expensive exclusive kinda needed to bring more to the table than paint masks. Plenty of expensive exclusives only bring to the table a few paint masks. Heck with just a couple exceptions, pretty much all of eHobby's exclusives are straight redecoes. Same goes for the Wonderfest toys when Takara has them. Not to mention the Million Publishing exclusives. Besides, Evac's head is already the perfect heroic Galvatron head. That's why the toy was chosen. EHobby's exclusives aren't expensive, though. Sure it's ~$40 for a deluxe. But United deluxes are like $35 after import markup anyway. That is, when importers aren't fleecing you ($50 for Tracks, etc) like they do with the various store exclusives. I would argue that a lot of larger BotCon exclusives are perfectly fine without new heads, and that they're certainly not a "necessity." And it's not like 2011 had an odd shortage of new heads in its lineup. Sometimes expectations can be unreasonable. I picked up a Botcon Galvatron for about that much. It seems to be about the going rate-ish. I have to disagree about the head, though. Previous discussions make it clear that I'm a minority on that, but I think it's at best a passable head, and meaningfully different from how he looks in the comic. I understand why they didn't use a head remold when Evac's head wasn't offensively far from Galvatron's, but I'm still disappointed that a faction leader didn't get more. No one recognizes him as Galvatron on the shelf, even though they recognize the classics Galvatron who's right beside him. I think that's more the body shape and paint than the head, though. Is that in hand in the UK or are you paying a small fortune for shipping? It makes all the difference! I got my set of the two for about ?82 shipped. Even with the club having them back up at $92 for members it would work out at more than that once shipping is involved. Edited by Bass X0, 05 August 2011 - 05:59 AM. Nice one! I so often see US-based auctions which look like a reasonable price before I see the shipping. ?32.90 actually almost looks like a shipping charge. I just want to clarify that I wasn't saying Galvatron needed a new head, just that not having one may make him slightly less popular (but it could be any number of things). You could take it as a compliment! After all, I is livin' in South East London innit. It's kind of a shame he isn't more popular, it's quite a good mould and the colour scheme is nice. That said mine's still sealed and I'm torn over selling it. Though considering the deal Bass X0 got maybe I should hang on after all. I'm kind of surprised that they're going for so little. I think I overpaid a bit at $85 shipped, but it was the only exclusive this year that appealed to me. This is demonstrably untrue. LOTS of people have gone on record as how "Galvatrony" this figure is. It feels like kind of a red herring to be debating how much he passes for G1 Galvatron anyway, considering he ain't. Considering they were $92 or something at the convention, plus tax people were paying around $100 for them. I'd say you didn't, unless you're just talking about Galvatron and not the pair. I just saw that myself. You can't buy the loose sets unless you've already purchased the box set. While I sort of get the idea behind that, it still seems sort of crazy. They still have last year's loose set in stock as well. How many people will dump another 200 plus bucks on this set (except scalpers of course who can turn around and use it recoup some of their losses)? Just got him in the post today. I do have a concern though, the hinge at the waist seems weaker than my Live Convoy's and I had to use a little force to transform him, although I remained cautious. I also noticed a very tiny stress mark after I had done so. Is this a common problem? I didn't get the Blades or Springer repaint so I don't know if the mold has been degrading over the years or of its new to Galvatron.